Chris Corrigan, the maritime industry boss who led the attack on the MUA at Patrick in 1998, is back and once again trying to break the union. His company Qube have established a fenced yard INSIDE the Patrick terminal with non-MUA labour, being paid well below union rates to do wharfies work. 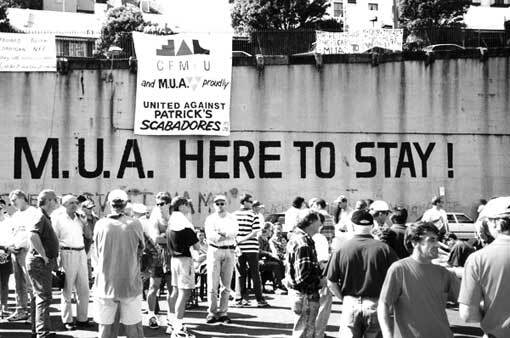 MUA workers at Patrick are fighting back hard and some have been stood down for refusing to co-operate. They urgently need support from the wider trade union movement and activists. This Sunday to show that there is a strong community movement behind them willing to fight. If you can't make the start time, join other concerned workers and members of the community outside the Patrick terminal on Penrhyn Road through the afternoon. Stop union busting and wage theft at Patrick Port Botany! Defend the MUA!